I want to tell you a story about when I was a young boy going to school. You know, I didn't mind school too much, but in those days I was very envious of the school Captain. His name was Renton, and he sat just across the aisle from me. He was the best soccer player in the school and that's what I wanted to be. He was the best at cricket, and I liked cricket. He was the best runner we had, and I liked running. He was not only an excellent athlete, but a very good artist as well. And on top of all that, he was the smartest guy in the whole school. knew, but she always did. I'd get up that morning and say, "Oh mother, I don't feel good at all. I think I should stay home today." But she'd always say, "You can stay home *tomorrow* - but not today." But staying home tomorrow wouldn't do me any good because *today* was the day of the final exam. *Today* was the day of judgment! (I Cor. 3:14-15) "If any man's work which he had built upon it remains, he shall receive a reward. "If any man's work is burned up, he shall suffer loss; but he himself shall be saved, yet so as through fire. " devastated by fire. They all knew firsthand what damage fire could do. When the fire swept through Corinth, every house that was built out of wood, hay, or straw, was devastated and left in ashes. But the more wealthy people there had houses built with beautiful pillars of granite, and some even had houses built totally out of marble. These houses made of costly stones were still standing after the fire swept through, though they were obviously very badly scorched. probably buy half the straw in Texas for $10,000, but, boy, you're going to have a mess when the fire gets to it.Instead of ashes to your ankles, or ashes to your knees, it'll be up to your nose maybe. But that's what some lives are going to be like: wood, hay, stubble - then ashes. that will be left is ashes. Will our life's work stand the test of the fire when we come before the Lord? Will it have lasting eternal value or will it end up in ashes? There's an interesting difference between wood, hay, straw - and gold, silver, and costly stones. Wood, hay, and stubble are found above the ground. They catch the eye, just like many people's ministries do. They are quite plentiful and easy to find. On the other hand, silver, gold, and precious stones are found below the ground. Nobody sees them - again, like many people's ministries. They're not just lying around in a field somewhere for anyone to pick up. They are much harder to come by; in fact, it takes a lot of hard work to get them. That's why they are so expensive. They are of much higher quality than many other things, and much more rare too. Again, it's the *quality,* not the quantity that sets their value. Many things are difficult in the Christian life, but we should desire to acquire those things which will hold their value, not only on earth, but in heaven as well. Well, that's what many are doing now. And they're not satisfied that you give while you're living, they ask you to hand over your house and all the rest to them in your will. They're going to give an account to God in that day, but I believe we're also going to give an account. Jesus Christ. He doesn't just take your sins - He takes all of you. Oh yes, many may want to get filled with the Holy Ghost and get a bank balance, but how many of you are big enough to say, "Lord, in this crucial hour in human history, let me fill up with the sufferings of Christ"? Can He share His sorrow with you? huh? So you don't have time for basketball or going to see a baseball game?" No, maybe you don't, but that's nobody's business but yours and God's. Do you get so near to the heart of God that you share His grief over the world and over the backslidden church that we have today? One of the most famous preachers in the country recently called at nearly midnight and said, "I've come to this conclusion: God Almighty has already taken His hand off America - for the simple reason that we've had so much light and we've rejected it! It's not only true that we live in a world of bankrupt politics, we live in a world (this is the most tragic part of all) of a bankrupt church. Oh Lamb of God deliver me! I heard a woman say not long ago, "Well, praise the Lord. I'm glad I don't have to account for anything when I go to heaven. There is no condemnation for those who are in Christ Jesus." Wait a minute, you can never isolate a scripture by itself. There's no condemnation for our past sins, and I'm sure we are all mighty glad of that. But God was always saying to Israel, "Remember when thou wast a bondsman in Egypt...remember your sin. ..remember your iniquity." You might say, "It doesn't say the Christians are going to be judged out of the books." The Bible says that "we shall *all* stand before the Judgment Seat of Christ" (Rom. 14:10 KJV). I think that scripture means just what it says. singing Father, Son, and Holy Ghost, Hallelujah." You know, they dance to that every night down in New Orleans. They shuffle their feet along Bourbon Street and have a great time, but that song is not for them, it's for the REDEEMED. It says, "When the *saints* go marching in." 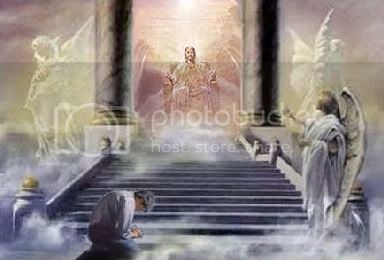 The saints will march into heaven in a multitude which no man can number. weariness, and fastings, and pain, and tribulation, and distress, and famine, and nakedness. He was subjected to false brethren and to perils of the deep. What do you think his reward is going to be for living a life like that? Silver, gold, precious stones. What are the precious stones? When I read that, I think of the breastplate that was on the priests in the Old Testament. It was divided by four rows of stones - three stones in each row. Each stone was different. Each stone stood for the name of one of the 12 tribes of Israel. The priest wore the breastplate over his heart as he went into the Holy Place to pray for the sins of the people. through the blood of Christ and the anointing of the Holy Spirit. part of the Royal Priesthood (I Peter 2:9). we don't drink or lust or damn ourselves every day. We're Christians now...and we're so content and so happy and so satisfied. The silver . .. what is the silver? I guess you can interpret it in different ways. But I like to think of the scripture in the book of Proverbs that says, "The tongue of the righteous is as choice silver" (Proverbs 10:20). I believe that the silver may signify the words that we speak. quiet, you just spilled out everything that was on your heart at that moment? And can you think of all the awesome words we've preached to thousands of people over the years? We're going to answer for every word - and the fire is going to be put to them. Will they be wood, hay, or stubble - or will they abide the fire? What is gold a sign of? I believe it's a sign of our devotion to God. If I could have a small melting pot here, I'd put your $10,000 worth of gold in it and melt it down. What happens when you burn gold? Nothing! It just changes from solid to liquid, but you don't reduce it. Can you see all the saints standing in heaven? And there's Leonard Ravenhill - standing before Christ whose eyes are filled with holiness. The whole place is breathing holiness. am I just a showman? What's my secret life like? how majestic I think he is in God. knees like a camel has. I said, "Yes, I see that room." founder of the Salvation Army. There's John Wesley. "B's," I find the name, David Brainerd. nowhere to pray in the Indian camp. wood, it won't be hay, and it won't be stubble. our heads in shame and humiliation. but weep and you weep alone." and humble ourselves and say "Almighty God!" if the lamp of my life has been burned out for Thee." Do you think all Christians die happy? Not on your life! You would only spare me, I'll do this, that, or the other." Well, have you done it? real joy and lasting happiness. those who love His appearing (II Tim. 4:8). heaven. There will be great distinctions there. there will be signs in heaven. "These are the Prayer Warriors." "These are the Great Sufferers." she was doing it as unto Him! right because Jesus said he would - but he wasted his life. orphanages and churches. He printed Bibles and hymn books. Wesley said, "I'm sorry, I have to go." "But it's not yet nine o'clock, why are you going?" "At four o'clock tomorrow morning?" "Every morning of my life," he said. our whole being in Jesus Christ!" it - before I realized that she came for one reason only. never said a word while she was there. Did you get up this morning and thank God you were pure? I think again of a statement A. W. Tozer made to me once. freely given us all things (Rom. 8:32). thought, "There's something different about those girls." people on this earth, we've no right to live here. war. Those things don't make any difference. that power, and have our whole being in Jesus Christ! and what's more, there's no possibility of any repetition. after all. It's a majestic thing. read by all the millions in eternity? at Your appearing" (I John 2:28).